Heating, ventilation, and air conditioning ) is the technology for regulating a room’s temperature to comfortable levels. It’s goal is to provide thermal comfort and acceptable indoor air quality. AC units are used for both domestic and industrial purposes to maintain temperatures to certain levels. They work by removing heated air from inside of a building, forcing it outside. Air conditioning and refrigeration are provided through the removal of heat. D&L, Inc. is licensed for all aspects of HVACR, from design and construction to service and maintenance. We have been in business over 30 years and have acquired a reputation, with our various clients, as one of the Best HVAC repair businesses in Florence, SC. ​Give​ ​us​ ​a​ ​call​ ​at​ ​843.393.6523​ to get the high-quality service you deserve. Air conditioning systems are used in offices, homes, schools, and most buildings that people frequent. Yearly maintenance of AC systems lead to increased AC performance and lower energy consumption. The first place we recommend checking is at your local AC shop. AC shops usually have a list of HVAC contractors who provide AC repair services in the area. Air conditioning systems are used in offices, homes, schools, and most buildings that people frequent. Are you thinking of getting one for yourself, or do you already have one? 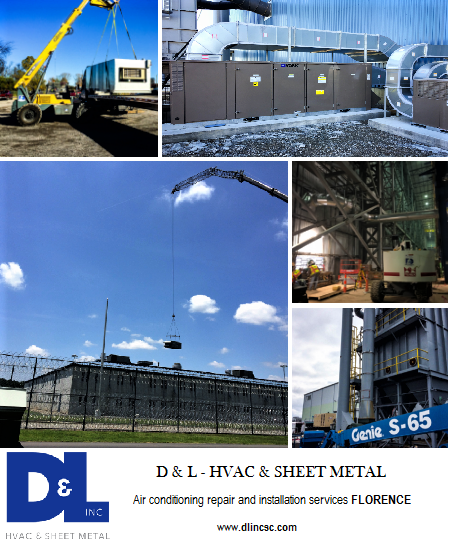 Cool Off Your Summer With D&L INC. Sunny days like today always reminds us of how lucky we are to have functioning AC units everywhere. You can find them inside most homes, offices, stores, cars, etc.